The Clayton House is our latest project featuring the first Tradical ® Hemcrete® house in Florida. The house, built in a coastal community, will meet all hurricane safety codes. The walls will be constructed using Hemcrete® with a directly applied Baumit Lime Rendered Finish on the outside, and a US Heritage Group lime plaster on the interior walls. These are revolutionary products to use in a hot, humid climate like Florida because the walls are entirely breathable, unlike commonly used concrete. In a climate like Florida’s, moisture and mold growth in buildings can be a major problem. Cured and dried Tradical® Hemcrete® is a vapor-permeable (Breathable) material that must pass moisture to the internal and external faces of the wall. Tradical® Hemcrete® is a unique, highly sustainable construction product used to create insulating walls as well as insulation layers for floors and roofs. These products comprise a bio-composite building material that can be used to create buildings that have excellent thermal / acoustic properties as well as creating a healthy living and working environment. 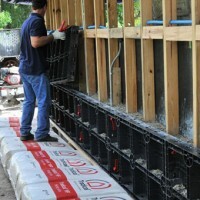 Tradical® Hemcrete® is sold in the US by American Lime Technology. Our vision is a developed North American market for lime and breathable natural materials in high performance building envelopes that are healthy and sustainable.